Fact or fiction? We give you the scoop straight from a veteran's point of view. Looking back at what would have been my job for most of my life, I can’t help but wish I were still young enough to keep doing what I did. Decades of being up in the air was not all glitz and glamour—there’s hard work involved, a lot of dedication, and a passion for flying. People think being a flight attendant is an easy task. Passing the height requirement and knowing how to converse well barely cover most of the qualities you need to possess. There’s a lot of regulatory standards you must comply with, tests that need to be passed. Read on, CGs, if you feel like you have what it takes to be 30,000 feet above land. 1. There’s a psychological exam involved. After the physical assessment—looks, height, and pleasing personality—airlines make sure that their employees are stable and able to deal with stressful situations. With a job that primarily functions to ensure safety of the entire cabin, it is essential that your flight attendants are able to work under pressure, especially when faced with an emergency. 2. You don’t need to take Tourism as your course in college. As long as you’re a college graduate, your field of expertise shouldn’t matter! Airlines provide you with the necessary classes and training sessions before releasing you on field, so whether you’re a mathematician, historian, or artist on paper, you’re qualified to fly the skies! 3. Passing Safety and First aid training is a must. Speaking of the provisions they provide you after passing the initial hiring process, you must ensure to not only attend these classes, but pass them as well. The grade you need to get for Safety to qualify you for release? A mind-blowing 90%. Better study up! 4. Can’t swim? Forget about applying. Flight attendants who can’t save passengers, let alone themselves, in an emergency water landing are a no-no. 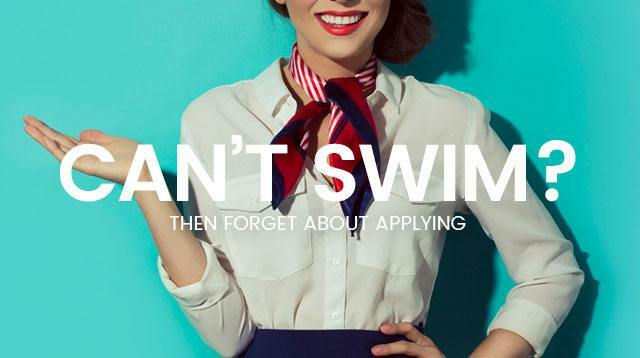 Make sure you know the basics of swimming before attempting to apply! 5. Visible tattoos or piercings are not allowed. To keep with the standards of grooming and physical appearance, the only allowed piercing to have is one on each ear for girls. For guys, absolutely no tattoos and piercings, please! 6. Everything is provided for. Hard work pays off! From uniform, luggage, food, and down to the per diem per outlying station—flight attendants are given everything they need to take on their job. All you have to do is show up on time and bring your enthusiasm on each flight! 7. Your dependents get to travel for free. Perhaps the best perk and biggest open secret: Your family gets to travel for free. Can it get any better than that?